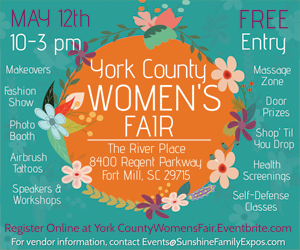 Join us for the York County Women’s Fair? presented by Absolute Total Care on Saturday, May 12th from 10:00-3:00 pm! Come celebrate Mother’s Day weekend and get pampered! This FREE event offers dozens of vendors focusing on educating, empowering, and nurturing women PLUS free activities including a fun photo booth, massages, makeovers, airbrush tattoos, self-defense classes, fashion shows, door prizes & more. Get ready to shop ?til you drop!